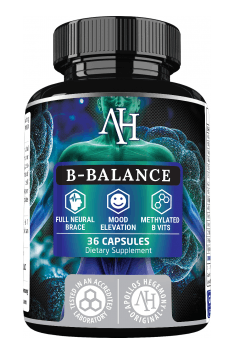 Apollo’s Hegemony B-Balance is a dietary supplement that can be considered the leader in terms of B vitamin supplementation. In this product, the manufacturer offers the entire range of those vitamins along with substances that fantastically complement the formula, support insulin metabolism, improve the functioning of neurotransmitters, and increase the overall absorbability of the product. Vitamins of the B complex are coenzymes. It means that they participate in most metabolic reactions in the organism, which are essential for the maintenance of homeostasis. Vitamin B1 (thiamine mononitrate) – first of all, it is worth mentioning how unique the form of mononitrate is. It is more stable than the hydrochloride derivative form used in other products. Additionally, as the compound is broken down, the nitrate released alongside thiamine can have a positive effect on the circulatory system. Thiamine itself is crucial in glucose metabolism. Its high consumption is recommended in the case of problems with high sugar levels (the phosphate derivative form, thiamine pyrophosphate, directly participates as a cofactor in the reactions of biochemical breakdown of the substance, mainly within the cytosol and the mitochondria). Vitamin B2 (riboflavin) – if the amount supplemented is the basic demand for riboflavin (about 1.5 a day), it is essential for the production of two important enzymes, FMN and FMD (which take part in respiration, among other processes). In the case of a much higher dose, like the one used in the product, riboflavin can exhibit the ability to support migraine treatment by regulating the functioning of mitochondria. The optimal level of riboflavin is also connected with its positive effect on the right level of haemoglobin (the effect is intensified in the case of additional supplementation with components responsible for proper haemoglobin levels, like iron). Riboflavin can also indirectly reduce the levels of homocysteine, which increases the risk of ischaemic heart disease (mainly by supporting the genetic mutations of the gene MTHFR). Reduced blood pressure has also been observed. The substance also exhibits anti-inflammatory properties (mainly within the pancreas), and supports eye function: it supports photoreceptors and has a protective effect on the eyes. Vitamin B3 (niacinamide and nicotinic acid) – a greater proportion of niacinamide in vitamin B3 forms can help to eliminate the effect of a niacin flush (a result of activating the receptor HM74A, increasing the secretion of pro-inflammatory prostaglandins, and the final activation of the receptor PGD2), which causes skin reddening and itching, often observed at the beginning of the use of preparations containing high amounts of niacin in the form of nicotinic acid. It is not a dangerous effect in terms of health but it cannot be called a pleasant feeling. Niacinamide exhibits far smaller affinity to the receptor responsible for it, which explains why it does not cause the effect. Proper supplementation with substances that demonstrate the activity of vitamin B3 is connected mainly with the support for the lipid profile in the organism (visible increase in HDL and drop in LDL, triglycerides and cholesterol). The effect on the lipid profile is also connected with its ability to reduce the risk of cardiovascular system diseases. Another factor that can reduce the risk of developing the coronary heart disease is the anti-inflammatory property and the ability to reduce vascular endothelium damage. Niacin also exhibits the ability to facilitate blood flow and helps to reduce blood pressure when it is too high. Niacin supports adipose tissue reduction. It increases the release of adiponectin and leptin, that is hormones responsible for metabolising glucose and fatty acids, as well as the sensation of satiety. Vitamin B5 (calcium pantothenate, pantethine) – two forms of vitamin B5 were used in the product: the more basic one, the calcium derivative of pantothenic acid, and pantethine. Pantethine is the more interesting form: it consists of two molecules of pantothenic acid bound by cysteamine. When the compound is degraded, the latter can help to improve cysteine metabolism in the organism and is one of coenzyme A precursors (along with vitamin B5 and ATP). The basic function of vitamin B5 is participating in the production of coenzyme A, one of the most important coenzymes in the human organism (for example, it takes part in the production of energy – it moves acylated fatty acids through the mitochondrial membrane, which are then used as an energy substrate). It is crucial for maintaining the right physical capacity and proper fatty acid metabolism during physical effort. Additionally, vitamin B5 is present in the brain in quite high amounts, which suggests its function in the formation of neurotransmitters. It is also associated with antioxidant properties. Vitamin B6 (pyridoxal phosphate) – a vitamin that, despite having no visible biochemical features, exhibits a multitude of synergic connections (or is an indirect enzyme – enzymes that participate in a given reactions depend on vitamin B6), and is required as a coenzyme in some biochemical reactions. First of all, it is good to mention the form of the vitamin used in the preparation. Pyridoxal phosphate (P-5-P) is a metabolically active molecule, while is usually used in other products containing vitamin B6 must be converted to the form first (remember that every biochemical reaction is connected with active substance losses). The common forms are pyridoxine, pyridoxal, and pyridoxamine. It exhibits many correlations in the nervous system. As an indirect enzyme, it affects L-DOPA conversion into active dopamine. The deficiency of the vitamin is connected with reduced activity of serotonin receptors in the hypothalamus. Both mechanisms are connected with good mental well-being; therefore, it can be concluded that vitamin B6 determines psychical comfort to some extent. The compound also contributes positively to the mechanisms of adipose tissue reduction. It reduces the synthesis of fatty acids by reducing the activity and expression of fatty acid synthase (FAS). When administered interventionally with leucine to obese people (2.25 g + 30 mg of the basic form of vitamin B6 – pyridoxine), it was proven to accelerate adipose tissue reduction by about 34 g.
It also affects hormone economy in a positive way. It can increase the release of growth hormone and stabilise the levels of prolactin in the case of its excess. Vitamin B7 (biotin) – referred to as the vitamin of beauty, as it is often used in preparations that support the growth and condition of skin derivatives (hair, nails, glands) and of skin itself (the transporter of creatine cells that form the skin and its derivatives is closely connected with proper biotin levels in the organism). Other scientific studies demonstrate its ability to improve the lipid profile in the organism, as it reduces the levels of triglycerides and vLDL. Preliminary studies also demonstrate the dependence of glucose metabolism on biotin. The level of glucokinase, the key enzyme responsible for glucose utilisation, is reduced in the case of biotin deficiencies. Initially, it is also believed that the vitamin increases the release of insulin after meals, which can support the circulation of nutrients in the organism. Vitamin B9 (methylfolate) – another vitamin used in its best form available. Methylfolate is the form that directly takes part in important metabolic processes in the organism. For comparison: in order to be converted to the form of methylfolate, the basic form, that is folic acid, it needs four additional processes, and every reaction means losses of the active substance, which has a crucial effect on the final dose. It is worth paying attention to when comparing vitamin content in various products. Vitamin B9 itself has a positive effect on the nervous system, especially in terms of treating depression and similar nervous system-related ailments. If it were not enough that proper folate levels help to reduce the risk of depressive diseases (a study was able to predict a depressive episode based on reduced folate levels), it can also be used in the case of drugs that serve as an aid in therapy (mainly SSRI and SNRI). It exhibits neuroprotective properties as well. Folate has great anti-inflammatory properties, too. The most important mechanism in this case is its ability to prevent oxidative DNA damage. In terms of the health of the circulatory system, it reduces homocysteine levels (one of the markers of coronary diseases). It also has a positive effect on the chemical regulation of vascular permeability. Ladies might particularly appreciate the fact that proper folate levels are crucial for maintaining safety during pregnancy. The right supplementation with vitamin B9 can reduce the risk of neural tube defects in foetuses to 0. Apart from the child, it also protects the mother during pregnancy. Vitamin B12 (methylcobalamin) – again, it is good to describe the form of the compound first. As in the cases above, the best form available was used (the one out of two that exhibits direct coenzymatic properties), while other forms, including the one used the most often in vitamin preparations, that is cyanocobalamin, has to be converted to one of those forms first, which, as mentioned before, is connected with losses of the active substance. Vitamin B12 works in synergy with vitamin B9. It supports the prevention of depressive states. It also has a positive effect on the restoration of cognitive functions in the case of cerebral lacunar or sinus infarction. Along with vitamin B9, it helps to regulate homocysteine levels in the organism and works preventively during pregnancy. Choline – supports the nervous system in many ways. It is a precursor of one of the most important neurotransmitters, acetylcholine, whose proper levels are crucial for proper nerve communication. Inositol – an intercellular signalling molecule, similar to glucose. The greatest hopes connected with it lie in supporting glucose metabolism and the treatment of insulin sensitivity. Insulin sensitivity is connected with disorders in the proportion of two inositol signalling molecules (P-IPG and A-IPG). Inositol balances the proportions of the molecules, that way helping to reduce insulin sensitivity. The inositol signalling molecule (PIP3) affects communication between proteins that mediate insulin signalling (to be more exact, the signalling between PI3K and Akt, which finally affect glucose absorption by the transporter GLUT4). It is believed that other compounds also affect mediatory communication within insulin metabolism. It also affects positive nervous system-based well-being. The right concentration of inositol has antidepressant and anxiolytic properties as well as works as an aid in the therapies used in states of nervous tension. PABA (para-aminobenzoic acid) – associated with supporting the nervous system (tiredness and irritation reduction) and a positive effect on the condition of the skin and its derivatives (it is often recommended in the case of premature hair greying). Piperine – it is known mainly as an assimilability-increasing component, which is based on a few mechanisms: it intensifies absorption in the small intestine, inhibits the enzymes that break down active substances, and slows down movement through the intestines, that way increasing the time that can be used by it to absorb substances. To sum up, Apollo’s Hegemony B-Balance is a complex product in every aspect. It contains all the vitamins of the B complex in effective doses, and the complementary components work in synergy with their mechanisms. The product will prove excellent for preventive supplementation, for supporting the organism in many ways, especially in the case of exposure to particularly intensive physical or intellectual effort, and for supplementing deficiencies confirmed with blood tests. The recommended dosage is 1 capsule a day. Take with a meal and plenty of water to avoid an upset stomach. On training days, take one portion before workout. Vitamins of the B complex have a positive effect on many metabolic functions, which will help to maximise exercise capacity. Pay particular attention to the instructions regarding taking the product with a meal and water. If you neglect those instructions, you may experience intensive nausea, especially in the case of a high-fat diet.